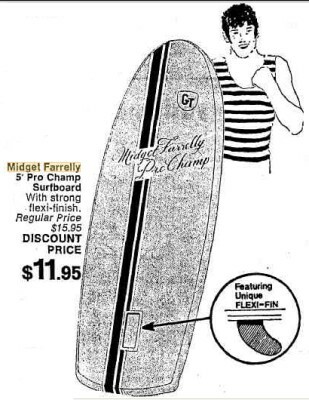 1972 Coolite : Midget Farrelly Pro Champ 4 ft 10"
Molded coolite foam, painted deck, adhesive decal, rubber fin and box. Deck: Molded 'H' logo,R/h tail - for Haminex. Donated by John McInnes. Severe wear,deck colour almost gone, structural cracks especially in the nose, dinged rails, fin loose. Early 1970's moulded polystyrene foam board, an adaptation of the paipo/Surf-o-plane design used principally by juveniles. Term origin : Polystyrene foam was first marketed circa 1958 in Australia as a low-cost portable insulated food or beverage container, brand name ‘Coolite’. 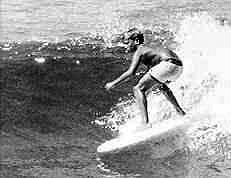 The first boards bore the 'Coolite' brand and subsequent models; including 'Midget Farrelly', 'Pipeliner'; retained the generic name. 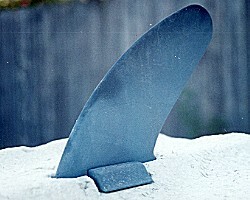 Advanced models used a moulded rubber fin, e.g. 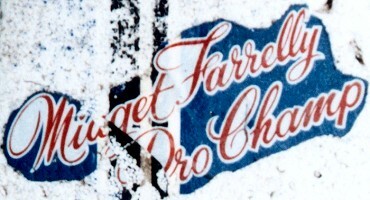 Midget Farrelly model. Later models featured a GT badge. 1980’s models were inserted in a woven fabric cover to limit foam damage. In the 1970's small groups of riders adapted production models, usually by fitting fins, to circumvent beach restrictions e.g. North Bondi. See Paipo Catalogue for other prone craft. Coolite rider, Margan and Finney 1970 page 157.